Good day! Welcome to the company Shop4game. Store opening hours from 11:00 to 23:00. But orders are accepted 24/7. Orders placed at night are processed from 11am. </ delivery>Our transfer methods are 100% safe and tested. We would never put a customer account at risk! 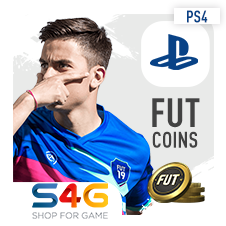 We delivered over 3 billion coins in FIFA orders for 2,5 years. We can move coins very fast to your account for you to be able to get playing again as fast as possible! </ Attention>deliveryWe are committed to deliver the goods to you as quickly and safely as possible! Safe coins in cases of full compliance with instructions from the operator. 2. After checking all the details with our operator, please proceed to payment using lots of available methods. Then you will receive unique 16-digit code on your email as a confirmation of your payment. 3. Share this code with our operator to activate your coins purchase. According to game rules it?s not allowed to buy or sell any coins / points involving real money. If EA Sports decides to ban you / your account, we do not take any responsibility on this (no compensation allowed!). By paying for the coins, you agree with this! Great seller! Super easy to work with. Seller was professional and fast, no issue with payments and quick response time.